Would you like to host or come shoot your TAIL off with us! We want to expand access to the format statewide. To build recognition of the indoor shooting format considered the “Sport” of Archery by World Archery/USAA – therefore building financial sponsorship for future college scholarships and earnings in Archery. The events provide consistent tournament experience – an application of a participant’s practice and a talent funnel for future performance programs. The events are an opportunity for Instructors/Coaches to test their students/teams. Individuals test their progress under pressure for performance awards (USAA Star Achievement Pins). Similar to a “belt test” benefit in other martial arts. The events provide a next level of competition segue and awards opportunity for the NASP audience. An opportunity for JOAD/AAA teams to compete regularly and network. What is required of a Host? A host will need at least 10 lanes indoors for shooters with appropriate bales. Distances are 18 meters, and 9 meters for youngest shooters. Targets are World Archery 40cm, 3 spot “Vegas”, and 60cm World Archery. Equipment for tournament conditions (scoring, timers, etc.) will be assisted with by TXAA. Participants: Individuals and teams prepare for the challenge of competition, test your growth, earn recognition and money! Texas Archery Academy (TXAA): Non-profit organization provides administration, marketing of the league, awards all USAA Star Pins, and conducts TAIL END. The Tournament League has been held the last Sunday of every month Jan – Oct since 2011 by Texas Archery Academy. 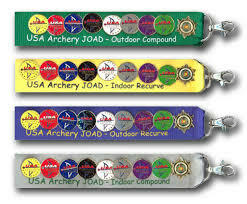 Consists of a 30 arrows (10 ends of 3 arrows), World Archery/USA Archery, Indoor event under tournament conditions. The events take about 2 1/2 hours (1pm registration, 2pm start). Each TAIL offers USAA Star Pin awards based on the participant’s individual score, and recognition for the winners of the Wild Turkey shoot off. These awards are mailed directly to participants by TXAA after each event. Tournament directors submit award requisition and enter the scores online, allowing all participants statewide to review scores and see how they are doing relative to others. After warm up and prior to the start of the 30 arrow TAIL, all shooters participate in a progressive survival shoot (18 meters at the same 40cm target). Following the colors of the target, competition eliminates shooters. A winner “last turkey standing” for each equipment style (all ages and gender included) are yielded by this shoot off. Ties are decided by closest to center of “X”. Winner receives a special TAIL award pin AND earns a chance to be in the TAIL END “Top Turkey” money shoot off! The League culminates with TAIL END, the last Sunday in November held at Texas Archery Academy. This is a 60 arrow Star FITA and Top Turkey $ shoot off! Shooter of the Year (SOY) awards are available by combining league participants’ two highest scores from the season, with their TAIL END score. Only scores shot at 18 meters on the 40cm size target can be used for the TAIL End League placements. The 60 arrow score seeds Top Turkey, where the top 8 scores shoot off for money prize based on equipment class only. These 8 shooters are comprised of the top 3 TAIL END scores and 5 Wild Turkey winners from season with the next highest scores from TAIL END. 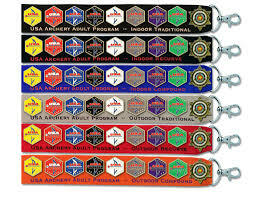 The Achievement program follows all USA Archery guidelines. Details are available on the USA archery web site, along with the youth and adult scoring matrix. Both youth and adults can earn USAA Star Pins for scoring achievements. Each Star Pin is a different color, and each has a successive number of stars on it to represent the increasing challenge in earning that particular award pin. To progress through the achievement program, the archer must earn each pin level in consecutive order, starting with the Green Star pin. Only one pin may be earned per event. The archer must shoot each pin individually, as a separate scoring session.